BUENOS AIRES, Mar 17 2015 (IPS) - In the wake of the fire that destroyed more than 34,000 hectares of forests, some of them ancient, in Argentina’s southern Patagonia region, the authorities will have to put out flames that are no less serious: the new socio-environmental catastrophe that will emerge from the ashes. 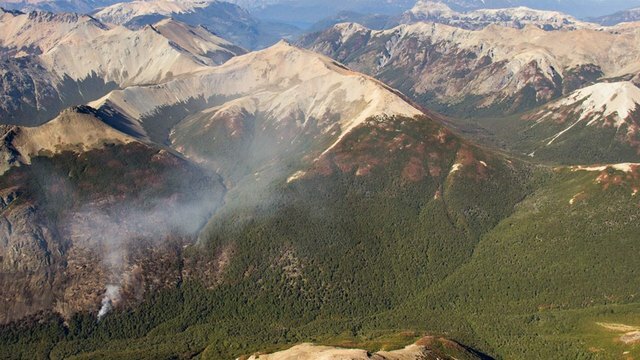 The worst forest fire in the history of the country will take a while longer to fully extinguish in the area surrounding Cholila, a town set amidst the lakes, valleys and mountains in the northwest part of the southern province of Chubut. Its 2,000 residents are longing for the start of the rainy season in April in this region that borders Chile and the Andes mountains. But in the town, which counts among its tourist attractions the fact that the legendary U.S. outlaws Butch Cassidy and the Sundance Kid bought a ranch in Cholila in 1902, as a hideout, the big fear now is what will come after the fire. The blaze broke out on Feb. 15 and was officially extinguished on Mar. 6, although there are still some hot spots, predicted to burn for another few weeks, according to experts. “We are very anxious. We lost the surrounding wilderness where we had chosen to live, and of course economic activity will be hurt,” pilot Daniel Wegrzyn, who had to close his inn on Lake Cholila, which was not affected by the flames but served as an evacuation shelter, told Tierramérica by phone. 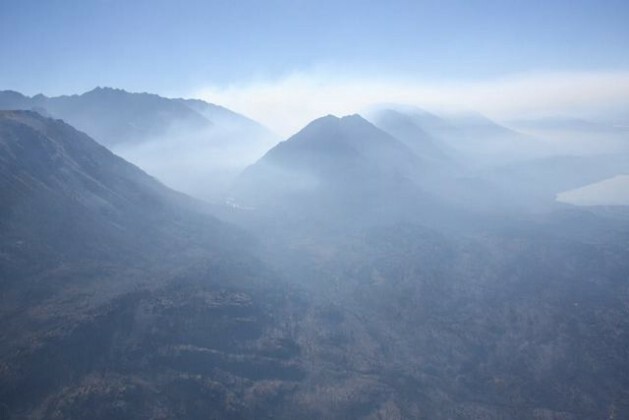 “The fires could hurt air quality and health due to the smoke and dust for months or years,” Thomas Kitzberger, an expert in Patagonian forests at the National University in Comahue, told Tierramérica. The fire also devastated pasture land. But livestock farming and ecotourism are not the only areas that have suffered losses. “Ecological damage is what lies ahead,” said Wegrzyn. The blaze destroyed forests of cypress, Antarctic beech (Nothofagus antártica), lenga beech (Nothofagus pumilio), coigüe or Dombey’s southern beech (Nothofagus dombeyi), Chilean feather bamboo (Chusquea culeou), and giant trees such as the Patagonian cypress (Fitzroya cupressoides). It also killed, or drove away, endemic fauna such as tiny pudu deer, lizards, birds and foxes, and endangered species like the rare huemul or south Andean deer. Others, like the forests of cypress, Dombey’s southern beech or Patagonian cypress, which are moderately resilient, “can survive fire and recolonise burnt areas.” But in the case of Patagonian cypress trees that have been badly burnt, the seedbeds have been killed and are basically irrecoverable, because it would take centuries for a new forest to grow. Furthermore, “the lenga beech is incapable of regenerating on these sites (of intense fires) or does so very slowly, which means it would also take centuries to grow back,” he said. Kitzberger pointed out that the forests are the habitat of numerous species, and “create locally stable conditions that make it possible for ecosystems to function.” When they are burnt down, “they give rise to ecosystems with more bushes or species of grass,” which do not play the same roles, he said. According to biologist Silvia Ortubay, there will be climate modifications that will extend to other ecosystems. “The wind cycles will change, as will the availability of oxygen, the humidity and evapotranspiration in the environment will be reduced, temperatures will rise, there will be more solar radiation and light, and the greenhouse effect will be aggravated,” she told Tierramérica from the area. There is a risk of worse flooding and drought, which means “drawing up a plan for restoring the ecosystem should be a top priority,” she added. She stressed that the local vegetation, organic matter and tree roots are a protective layer for the soil and act as a natural barrier for water, and that with the first rains and the dispersal of ashes, this layer will erode and suffer fertility loss. Runoff will also increase, causing mudslides and creating steeper inclines and ditches which aggravate the situation. At a regional level, “when the forest cover is eliminated by severe fires that affect upper river basins, the capacity of regulation and provision of good quality water is undermined, and the supply of energy generated by dams downstream is modified,” said Kitzberger. Ortubay said the transportation of sediments could also muddy Patagonia’s lakes, “which are considered the world’s clearest,” while the degradation of river basins, with lower water levels in the summertime and higher levels in the winter, would create floods or drought. Moreover, said the biologist, the deterioration of the forest will generate grasslands that will attract cattle, which will be an obstacle for seedlings to take root and for trees to grow back. And the cattle, through their manure, will spread seeds of invasive exotic species like sweet briar, one of their favourite foods. Wegrzyn complained about the lack of risk evaluation and “the delay in taking action,” while warning about the risk of new fires breaking out, based on what he has seen while flying over the area. He said everyone knew this was “a critical year” because of a phenomenon that occurs every half century: the flowering and death of the Chilean feather bamboo, which produces an enormous amount of highly flammable dry vegetation. There was also a severe drought and climate conditions that favoured strong winds and high temperatures in the southern hemisphere summer, “which were decisive for the expansion of the fire,” that at one point was spreading at one kilometre per hour. According to Wegrzyn, a few lookout towers in strategic spots, a good radio system and air patrols would have been sufficient to provide an early warning. Activist Darío Fernández told Tierramérica from Cholila that if caught early, “the fire could have been extinguished with shovels,” avoiding the need for bringing in brigades of firefighters, airtankers and helitankers from neighbouring Chile. The government sacked the official responsible for the National Fire Management Plan over errors in how the fire was handled, and stated that it had been intentionally set. To curb the land speculation, Buzzi announced measures such as a 10-year moratorium on selling or transferring land with forests that have been burnt, and the creation of an investigative committee. Fernández, born and raised in Cholila, who had predicted intentionally set fires, noted that between 2003 and 2011, the previous governor, Mario das Neves, distributed public land by decree, in violation of the provincial constitution. Fernández said the “green business” involves everything from country clubs and tourist developments to the forestry industry, which “needs to eliminate native species” in order to introduce commercial timber like pine. “The common denominator is the clearing of forests,” he added. These allegations run counter to the hypothesis that lightning started the fire – which Kitzberger and Wegrzyn said was improbable, since the last thunderstorm in the region happened on Feb. 3, 12 days before the fire started. However, both of them acknowledged that fire originated by lightning can smolder for days before a blaze breaks out. Nevertheless, he said that since the 1990s, in the north of the Patagonia region there has been a marked increase in the frequency and magnitude of electric storms and drought, which intensify fires. For example, in the Nahuel Huapi National Park, 160 km from Cholila, the last thunderstorm caused eight small fires, he said. “From politics to the mafia there is just one tiny spark,” Cholila Online, a digital newspaper founded by locals, wrote, summing up the doubts about the origin of the worst fire in Argentine history.